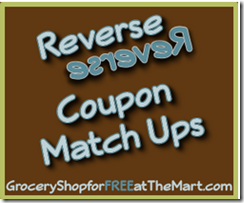 Listed below are each week’s Reverse Coupon Matchups where I list each coupon that came out in the paper that week and match it to the best Walmart price. Click on the link for the week you want to see, the most current lists are at the top. If you have any questions, email me at GroceryshopforFREEatTheMart [at] gmail[dot]com. WE will no longer be doing the Reverse Coupon Matchups moving forward into 2017. It’s been a fun run but you can the prices for all of Walmart’s products in the Walmart app so these lists have become unnecessary. 7/19 No Coupons This Week! No coupons this week. (4/20) Happy Easter! 7/22 Walmart Reverse Coupon Matchups! 4/8 No Coupons this week so check out our Price Match Lists to save at Walmart this week!